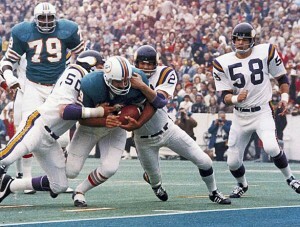 Larry Csonka rushed for 145 yards and two scores in Super Bowl VIII. Welcome to Part 2 of the 50 Greatest Individual Performances in Super Bowl History. In today’s section, the 40-31 performances are revealed. White spent much of the week leading up to the Super Bowl in a hospital suffering from pneumonia, losing 20 pounds. However, White suited up and started for the Steelers when they met the Minnesota Vikings in Super Bowl IX. White made three tackles and was credited with the first safety in Super Bowl history as he helped “The Steel Curtain” hold the Vikings to 119 total yards, the fewest in Super Bowl history, as the Steelers won their first of four Super Bowls with a 16-6 win. After the game, White went back to the hospital where he stayed for another 10 days. Csonka set the then-rushing record for most carries and yards gained by a running back as he carried the ball 33 times for 145 yards and scored two touchdowns in the Dolphins’ easy 24-7 win over the Minnesota Vikings for the Dolphins’ second straight Super Bowl title. Csonka became the first running back to be named Super Bowl MVP and the first running back to gain more than 100 yards in back-to-back Super Bowls(He had 115 yards in Super Bowl VII). Harris broke Csonka’s one-year record for most carries and yards gained by a running back as he carried the ball 34 times for 158 yards and scored the Steelers’ first touchdown, a nine-yard touchdown run on the fourth play of the second half, to be named MVP in Pittsburgh’s 16-6 victory over the Minnesota Vikings. Howard became the first special teams player to be named Super Bowl MVP as his 244 return yards lead the Packers to a 35-21 win over the New England Patriots and first Super Bowl title. Howard had six punt returns for 90 yards, his first return of 32 yards leading to a touchdown and then another return of 34 yards that put the Packers in Patriots territory where they got a field goal in the second quarter, and four kickoff returns for 154 yards, including the 99-yard kickoff return for a touchdown late in the third quarter that broke the Patriots’ back after they had scored a touchdown to close the Packers lead to 27-21. Tuck was the main force on the Giants’ relentless pass rush on Patriots quarterback Tom Brady, who had thrown 50 touchdown passes in the 2007 regular season. Tuck complied six solo tackles, two quarterback sacks, and a forced fumble, with his biggest play coming with 22 seconds before halftime when he sacked Brady forcing a fumble that was recovered by Giants defensive end Osi Umenyoira when the Patriots had driven into the Giants’44-yard-line. 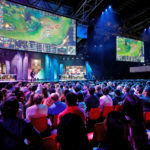 The turnover kept the Giants at a 7-3 deficit, which they would overcome in the second half and pull off the 17-14 upset over the previously undefeated New England Patriots. Ricky Sanders sparked a 35 point second quarter in Super Bowl XXII. Sanders got the Redskins’ 35-point second quarter started when he hauled in quarterback Doug Williams’ first pass of the quarter and ran it for a 80-yard touchdown, then followed that up with a 50-yard touchdown reception that broke the record for most points in a quarter in a Super Bowl. 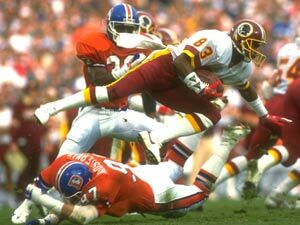 Sanders finished the game with a then-Super Bowl record 193 receiving yards on nine catches, with five catches for 168 yards and two touchdowns in the second quarter of the Redskins’ 42-10 rout of the Denver Broncos. The legendary quarterback was named the game’s MVP in the final game of his Hall-of-Fame career. Elway completed 18 of 29 passes for 336 yards and one touchdown, an 80-yarder to Rod Smith late in the first half, to go along with a 3-yard touchdown run early in the fourth quarter as the Broncos defeated the Atlanta Falcons 34-19 for their second straight Super Bowl title. For most of the first half, it appeared that Delhomme would be put one of the worst performances in a Super Bowl as he completed only one of his first nine passes for one yard and was sacked three times. But Delhomme caught fire as he completed 15 of 24 passes for 322 yards and three touchdowns in the last 3:05 of the first half and the second half as he almost lead the Panthers to an upset win over the New England Patriots. Delhomme threw the longest touchdown pass in Super Bowl history, a 85-yarder to Mushin Muhammad, and then went 5-of-6 for 71 yards on the Panthers’ last drive of the game that ended with a 12-yard touchdown pass to Ricky Proehl with 1:09 to go that tied the game at 29-29, before the Patriots kicked the winning field goal in the final seconds to give themselves a 32-29 win, despite the efforts of Delhomme and the Panthers. Rice put in another great performance in the Super Bowl as he helped 49ers quarterback Steve Young stepped out of the shadow of Joe Montana. Rice caught three of Young’s Super Bowl record six touchdown passes, the first from 44 yards out on the third play of the game, then another from 15 yards out, and the last touchdown for seven yards that gave Young the record. Rice finished with 10 catches for 149 yards as the 49ers easily dispatched the San Diego Chargers 49-26. 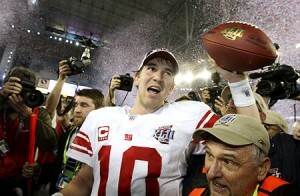 Eli Manning led the Giants to one of the biggest upsets in Super Bowl history. Manning joined his brother Peyton as a Super Bowl MVP when he led the Giants to a 17-14 upset over the undefeated New England Patriots. Manning was quiet through the first three quarters as the Giants only scored a field goal. But Manning was clutch in the fourth quarter as he completed nine of 14 passes for 152 yards and two touchdowns, and six of nine for 79 yards on the Giants’ 12-play, 83-yard game-winning touchdown drive that ended with him throwing a 13-yard touchdown pass to Plaxico Burress with 35 seconds remaining. Manning’s best play came earlier in that drive on a 3rd-and-5 at the Giants’ own 44-yard-line when he escaped from three Patriots defenders and launched a 32-yard pass that was caught by David Tyree, who used his helmet to maintain possession of the ball. Four plays later, Manning threw the game-winning touchdown and finished the game with 19 of 34 passes for 253 yards, two touchdowns, and one interception.